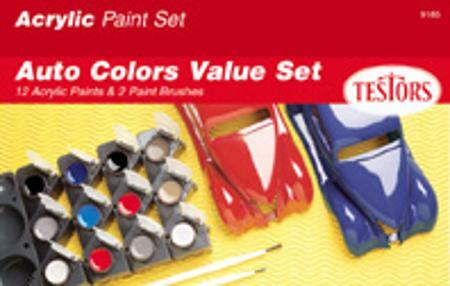 This is a Testors Model Car Acrylic Paint Set. Retail $9.42 SAVE 30% ! One paint and mixing tray, with two paint brushes. Non-toxic paint washes up with water. In case of eye contact, flush eye with plenty of water. IMPORTANT: Save box for paint color reference. Colors are arranged in the containers as they appear in photo. Model pictured not included with kit.